AudioQuest Rocket 22 speaker cable review | What Hi-Fi? We are careful never to pre-judge the result of a review, but in the case of AudioQuest’s Rocket 22, we had solid grounds for high hopes. 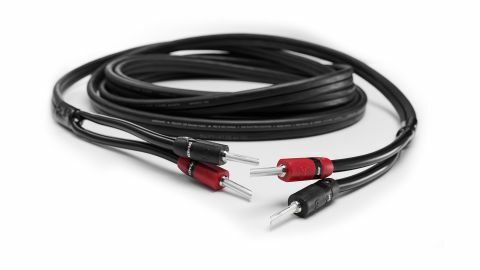 This speaker cable is the step-up option to the excellent Rocket 11 – the one that broke Chord Company’s formidable stranglehold to win our Accessories Award in 2018. The 22’s design mirrors that of the cheaper model, but uses higher quality copper conductors with a polished outer surface that’s claimed to give a ‘sweeter’ high frequency performance. The conductors use strands arranged in concentric layers, where each layer spirals in the opposite direction to the one below it. This configuration is claimed to reduce unwanted interactions between the strands and so lower distortion. Each pair of conductors is then twisted to improve rejection of external interference. There are four pairs of conductors per channel, and while our sample of the cable was terminated to be single-wired, the construction opens up the Rocket 22 to be bi-wired too. The cable also uses AudioQuest’s Noise Dissipation System, which is essentially specially designed layers of shielding that reduce the impact of RF (Radio Frequency) interference and EMI (Electromagnetic Interference). While this is a chunky cable, it’s also extremely flexible and shouldn’t cause any issues when installed. It’s available in two colour options – black and white. The ’22 isn’t a cable you should judge on an initial quick listen. Straight out of the packaging it sounds a little thick and murky, obscuring low level dynamics and some higher frequency detail behind an unusually smooth and full-bodied presentation. But given a few days of use, the Rocket’s sonic presentation opens up considerably. We use it as part of our reference stereo set-up – Naim NDS/555PS streamer, Gamut D3i/D200i amplifier and ATC SCM 50 speakers – as well as with Naim’s Uniti Star and a pair of Dynaudio Special 40 speakers with consistent and pleasing results. In both systems, we enjoy a spacious and refined presentation, one that sounds noticeably larger scale than when we substitute similarly priced alternatives such as the Chord Company RumourX and Ecosse ES2.23+. The sound is impressively detailed, uncovering low-level information and arranging it in a stable and cohesive manner. All that detail isn’t overtly highlighted either; here it exists in an even-handed delivery without emphasis. All of this makes for an easy-going balance that makes the Rocket 22 suitable for a wide range of systems. Despite its civilised nature there’s still enough in the way of dynamic punch and rhythmic drive to allow the sheer energy and attack of Nirvana’s Nevermind shine through. We play Tchaikovsky’s Marché Slave Op.31 and the Rocket helps our systems render pleasing large-scale dynamics and deliver plenty in the way of authority to the sound. Substitute Chord’s RumourX (£18/m) into either of our systems and you’ll get more in the way of focus and excitement, but the AudioQuest’s refinement and more relaxed attitude is equally admirable. The choice between the two is more a matter of taste and partnering system than any massive difference in ability. The Rocket 22 continues the fine work of its Award-winning sibling and, in a suitably talented set-up, the difference in price between the two (the Rocket 11 costs £12.50/m) can be justified by the improvement in scale, detail and authority.